After a memorable 35-year run, the Fullerton Children's Repertory Theater (FCRT) will be making their final curtain call on HIU’s stage. Since 1983, FCRT has been providing North Orange County youth with an opportunity to experience American musical theater. In 2012, the company began a partnership with HIU to stage shows twice each year in Hope's Pacific Auditorium. Since 2005, FRCT Directors Vicki Schindele and Brian Johnson have worked together to continue the longstanding tradition of providing quality musical theatre opportunities for talented youth. Together with their talented staff, including choreographer Annie Lavin, and supporting volunteer parents and friends, the FRCT has produced two full-scale Broadway musicals each year. To read more on the history of FCRT click here for an article by the OC Register. 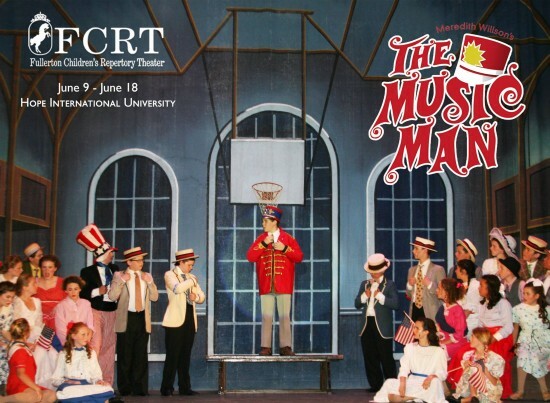 Their final production, The Music Man, runs June 9_18. Based on the book The Music Man by Meredith Willson and Franklin Lacey, this beloved Broadway classic follows Harold Hill as his con man antics go awry after falling in love with the town librarian. In 1957, the show became a hit on Broadway, winning five Tony Awards including Best Musical, and running for 1,375 performances. The popular show's remarkable success led to revivals, including a long-running 2000 Broadway run, a popular 1962 film adaptation and a 2003 television remake. For show details and/or to purchase tickets, visit FCRT’s website or “like” them on Facebook.